Dewatering screen panels are usually assembled various in the shape, size and mesh size for vibrating dewatering screen to meet different purposes of dewatering and grading. And the polyurethane screen panels are always adopted instead of metal mesh to obtain a good application effect, which are suitable for vibrating screens for fine-grained screening(dry and wet processing) in metallurgy, coal, chemical industry, construction, etc. It can also be used for the classification of certain corrosive materials. The dewatering screen panels fully exerts the advantages of excellent wear resistance, water resistance, oil resistance, vibration absorption and noise reduction, high strength, and firmness. At the same time, due to the variety of methods of polyurethane screen processing, so that the polyurethane screen panels have many superior characteristics. Since the dewatering screen panel uses steel wire rope as the skeleton material, and the polyurethane itself has a very high elastic modulus, high wear resistance, and high tensile strength. So its load carrying capacity is 2.5 times more than rubber screen plate, and is the best screen material in the world. The screen hole has a trapezoidal profile with a large upper and lower diameter and a large taper angle (140 degrees). In addition, the self-cleaning performance of screen panel is not blocked, and the dewatering screen generates secondary vibration during the operation, so that the adhesion of the fine particles can be effectively prevented. And is suitable for the screening and classification of wet fine material. The sieve plate structure is reasonable, easy to install and maintain, and reduce production costs. Suitable for screening of various materials in the range of 0. lmm – 170mm, no matter the dry sieve or wet sieve. The dehydration and de-screening in the range of o. 1m – 3mm more fully demonstrates the superiority of polyurethane screen. The polyurethane has a low density (1. 32kgl m 3 ) and is lighter than the metal mesh surface, which can reduce the production unit consumption, so it can adapt to the large-scale development requirements of the screen machine. 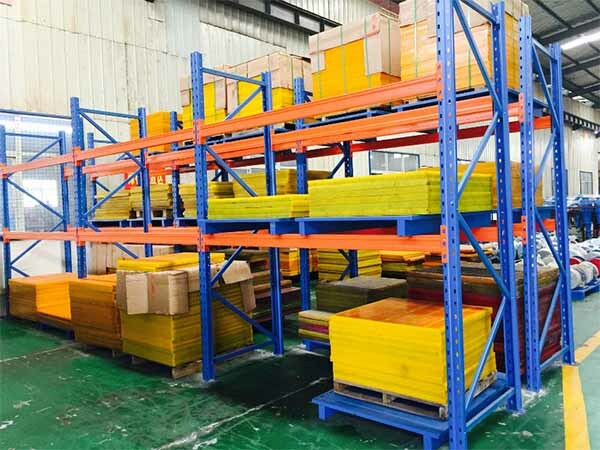 Due to polyurethane materials have a certain vibration absorption performance, and all kinds of accessories are made of polyurethane material to forms elastic joints in the process of screen panels installation. Therefore, the noise generated by screen machine during operation is greatly reduced. According to the actual measurement, the same screen machine uses polyurethane The can reduce the noise by 5 to 20 decibels than metal screen panels. So it meet the national environmental noise standards and improve the working slope. Although the same size of polyurethane sifter plate is higher than the one-time investment of stainless steel sieve plate. But due to the service life of the nitrogen grease sieve plate is 3 to 5 times that of stainless steel sieve plate, and the number of maintenance is small. So the total cost of polyurethane screen is reduced and the economic benefit is remarkably improved. Polyurethane sieve is resistant to water, corrosion, rust and pollution, and can also be used for screening certain special materials.